That's what NYSUT Unity is promising this year. This begs the question, why would anyone expect anything otherwise? If they weren't, there'd be no call to say any such thing. The wording is curious too. The campaign will be clean, they say, but they don't promise it will be honorable. The election with be honorable, but there's no indication it will be clean. I'm curious why they didn't assign both adjectives to one, or better yet both of these things. If I needed to assert that, I certainly would have clarified. I'd also offer examples rather than just my word. But that's me. 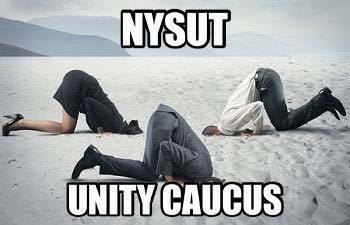 Yet my sources tell me that NYSUT has yet to agree to debate Stronger Together. Is that honorable? I hear that the implication, for reasons they haven't bothered to enumerate, is that ST Caucus is not honorable. I have my own issues with Stronger Together, but they mostly amount to an honest disagreement. I have very vivid recollections, though, of traveling all over the state to forums with Unity/ Revive, and I recall very well how they were arranged. The first one was in Long Island, and was pretty much open. We had no idea what the questions would be and each side got a few minutes to answer. I'm pretty sure that anyone in attendance would tell you we kicked their butts all over the place. Alas, of those that followed, all but one was much more tightly controlled. Some entailed everyone reading statements with no interaction. One like that was somewhere in Westchester and run by a Revive supporter. There was another, in fact, in Saratoga Springs, where they spoke, we responded, and then they got to speak again. Two to one. That's clean and honorable, isn't it? I remember that pretty vividly because I slept in some crappy hotel that night, woke up at maybe 4 AM, and then drove like hell to make it to work the next day. There was one in Newburgh, NY where they said they couldn't show because of work commitments. I felt very little sympathy because I went, drove home in a blinding rainstorm, and made it into work the following day. March 16th in Mount Kisco there will be a forum, and NYSUT Unity has not yet committed to it, Why? Likely as not because it will follow the same format as the one in Long Island did. I got to observe Andy Pallotta pretty closely over those forums, and I can tell you this--unexpected questions were not his forte. This notwithstanding, fielding questions from your constituents, whatever they may ask, is fundamental. What Pallotta is good at is reading statements. He's a very good reader. When he has a script he can sound commanding and persuasive. On the other hand, Martin Messner, who happily peddles MetLife/ NYSUT insurance that costs twice as much as Allstate, had trouble with that. This guy, who works with NYSUT finances, did not appear to understand what he was reading. Maybe that's why he can endorse an insurance plan that makes us pay double. Who knows? Let's talk honorable. Is it clean and honorable to dump the sitting President for acting like a President? Once Richard Iannuzzi took action against Andy Pallotta for supporting a Cuomo gala, his fate was sealed. Iannuzzi curtailed Pallotta's money supply, which was a big no-no. NYSUT finances are a mess, in fact, according to my friend Harris Lirtzman, among others. I'm not sure why that merits re-election. I'm not even sure why the deteriorating pension tiers or the APPR that's brought morale to a low I've never seen in three decades teaching merits it either. In fact, as far as I can tell, the only legislative victory Unity/ Revive achieved was to get double pensions for the officers, so they wouldn't have to go through what they put Lee Cutler through. How about Karen Magee? I'd heard almost two years ago that she wouldn't be getting a second term, because she somehow labored under the misconception that being elected President meant she was President. A friend of hers told me Magee herself didn't hear about that until January 2017. Anyway, it appears they're now doing away with the fiction that Pallotta doesn't run NYSUT and he's running for President, so we'll grant at least one point for their honesty. As for clean and honorable argument, the person in charge of the NYSUT Unity campaign feed is purposeful but less than admirable in that he traffics largely in logical fallacy. As far as I can determine, he would not know a proactive argument if one were beating him over the head. His prime argument against Iannuzzi was that he lived like a king because he held meetings in some club they'd joined in Albany. The Unity/ Revive folk said they'd prefer to hold meetings in Starbucks. Hey, Governor Cuomo, meet us at a Starbucks so we can negotiate an APPR that doesn't rely on junk science. How do you suppose that would work out? How many times do you suppose they did that? The last time I read the NYSUT PR guy he'd posted a personal attack piece against me. Among other things, he called me a part time teacher and a part time unionist. I discovered this piece because AFT President Randi Weingarten tweeted it and commented how good it was. I pointed out, on Twitter, that this managed to libel not only me, but also every working chapter leader in New York City, and Randi took it down. The rest of the post was strawman/ ad hominem nonsense. Several of my friends wrote me that they left comments, but this particular clean and honorable NYSUT Unity guy doesn't post them. That's one way to avoid argument, I guess. Another, of course, is to refuse to show up to a forum. What about it Andy? Are you willing to debate Michael Lillis? How about you Martin? Ready to debate finance? Are you guys willing to put your money where your mouths are and participate cleanly and honorably? Are you willing to stand alongside your opponents and let the public see how able you are next to them? Hey, it doesn't matter to me. I'm a New York City high school teacher, and like my 20,000 colleagues, I'm not represented no matter who wins. But since we have the honor of paying your salary and at least one of your pensions regardless, it would be nice to know that your campaign consists of something more than telling us how honorable you are. I have never known anyone, honorable or otherwise, to advertise not to be honorable. Saying how honorable you are, to me, means less than nothing. But hey, any time you want to show me you're honorable, I'm here every day, ready to accept your PR guy's apology. Alas, if you have any honor, you're also gonna have to stand in public and defend your record, repeatedly, and all over the state. 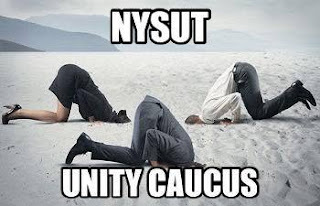 So what's it gonna be, NYSUT Unity? Are you gonna answer unscreened questions? Or are you fraidy-scared?